Below are a list of common kidney stones FAQs. If you have a question that is not covered below then please contact our team on 020 7432 8297 or email londonurology@hje.org.uk. A kidney stone, also known as a renal calculus, is a solid crystal build-up formed in the kidneys from dietary minerals in the urine. Stones can occur within the kidney itself as well as in the ureter (the tube draining urine from the kidney) or in the bladder. Sizes can vary, ranging from tiny microscopic crystals to stones as large as golf balls. Kidneys filter the blood by removing excess water and waste chemicals to produce urine. Urine passes from each kidney down a tube called the ureter into the bladder, then out of the body via the urethra once the bladder becomes full. Many waste chemicals are dissolved in the urine and these chemicals sometimes form small crystals in the urine which clump together to form a stone. In the UK, about 15% of men and 5% of women will develop a kidney stone at some stage in their life. They can occur at any age but most commonly occur in people aged between 20 and 40. Roughly half of all people who develop a kidney stone will have a recurrence again in the future. 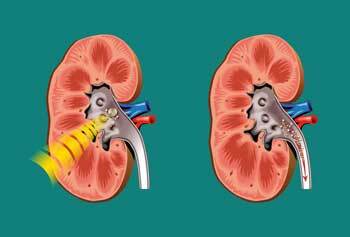 What Are Symptoms Of Kidney Stones? A stone that is stuck in a kidney may cause pain in the side of the abdomen. This is a severe pain which comes and goes and the result of a stone passing through the ureter (the tube that leads from the kidney to the bladder). As the stone becomes stuck the ureter squeezes the stone towards the bladder, which causes an intense pain in the side of your abdomen. The pain may spread down into the lower abdomen or groin. Sometimes it can be so strong that It may cause you to sweat or even feel physically sick. Urine infections are more common in people with kidney stones. Symptoms of an Infection include fever, pain when passing urine and increased frequency of passing urine. A stone can rub against the inside of your ureter, causing you to pass blood in your urine. In most cases, the reason for a stone forming is not always known. The majority of stones are made of calcium, though in most cases, the levels of calcium and other chemicals in the urine and blood is normal. Stones are more likely to form if your urine is concentrated. For example, you may be at risk if you exercise vigorously or if you live or work in a hot environment where you may lose more fluid as sweat and less as urine. In a small number of cases, a medical condition is the cause. Some uncommon conditions can lead to higher than normal levels of chemicals in the body, such as calcium, oxalate, uric acid and cystine. If the level of these chemicals is high enough, they can form stones. Certain medicines can make you more prone to developing kidney stones. These include diuretics (water tablets), some chemotherapy drugs used in the treatment of cancer and some drugs used to treat HIV. However, many people safely take these medicines without ever developing a kidney stone. If you suspect that the medication you are taking is causing your kidney stone, you should always consult with your doctor. Do not stop taking your medication without seeking medical advice. Recurrent urine or kidney infections. A kidney with scars or cysts on it. A close relative who has had a kidney stone. If you have symptoms that suggest a kidney stone, a scan or X-ray of the kidneys and ureters may be done. The aim of these tests is to detect a stone and to check whether or not it is blocking the flow of urine. A blood test to check that the kidneys are working properly. Blood tests to check the level of certain chemicals. Urine tests to check for infection and for certain crystals. What Are Possible Complications From Kidney Stones? Although the pain of kidney stones can be severe, complications are uncommon. Sometimes a large stone can completely block the passage of urine down one ureter and this may lead to infection or damage to the kidney. This can usually be avoided, as blockages can be detected by X-rays or scans and large stones can be removed. What Is The Treatment For Kidney Stones? Most stones that cause renal colic are small and can be pass out with the urine in a day or so. Drink plenty of water to encourage a good flow of urine. Your Doctor may prescribe strong painkillers to ease the pain until you pass the stone. Often no other treatment is needed. Some stones that form and stick in the kidney do not cause symptoms or any harm and can be left if they are small. Sometimes you may be offered medication to help the stone pass through. Extracorporeal shock wave lithotripsy (ESWL). A device producing high-energy shock waves is used to focuses on to the stones from outside the body in order to break them up. You then pass out the tiny broken fragments when passing urine. Percutaneous nephrolithotomy (PCNL) is used on stones not suitable for ESWL. A thin telescopic instrument called a nephroscope is passed through the skin and into the kidney. The stone is broken up and the fragments are then removed via the nephroscope. This procedure is usually done under general anaesthetic. Ureteroscopy is another treatment that may be used. In this procedure, a thin telescope is passed up into the ureter via the urethra and bladder. Once the stone has been located, a laser is used to break it up. This technique is suitable for most types of stone. Stone removal can be done by a traditional operation where a surgeon makes an incision in the skin to allow access to the ureter and kidney. This procedure is only needed in a very small number of cases where the above, newer techniques have not worked or are not possible. It may be needed if you have a very large stone in your kidney. In this video one of our kidney stones specialists Mr Leye Ajayi performs kidney stone removal surgery. Please note, this video contains footage from the operation. What Can I do To Help Prevent A Recurrence Of A Kidney Stone? About half of all people who have a kidney stone develop another one within 10 years. Sometimes stones can be prevented from forming. If you have had one stone, you are less likely to have a recurrence if you drink plenty of water throughout the day. By keeping urine diluted you reduce the chance of chemical build up. You should aim to drink between two and three litres a day (unless your doctor advises otherwise). If you live or work in a hot environment, you should drink even more. A dietitian may advise people with calcium oxalate stones to reduce the oxalate content of their diet. This may include limiting foods such as rhubarb, coffee and spinach. Uric acid stones can be prevented with medication. Other advice from a specialist may be appropriate for rarer conditions. To contact our kidney stones specialists you can call our team on 020 7432 8297 or email us at londonurology@hje.org.uk.